"After the prior week's gains, this was more of a consolidation week though it started with a solid decline on Tuesday. The selling was attributed to the 10-year treasury close over 3%, putting pressure on stock investors to exit equities for the safety of yields." The midweek announcement that a meeting with North Korea to arrange denuclearization of the peninsula resulted in a selloff. This is a news driven market for sure. But still the major indexes managed to end the week with fractional gains. For the S&P 500 Index that was + 0.31%. Since the SPX broke above its long-term declining trend resistance line, as well as its 200-day moving average line, the index has traded mostly sideways. 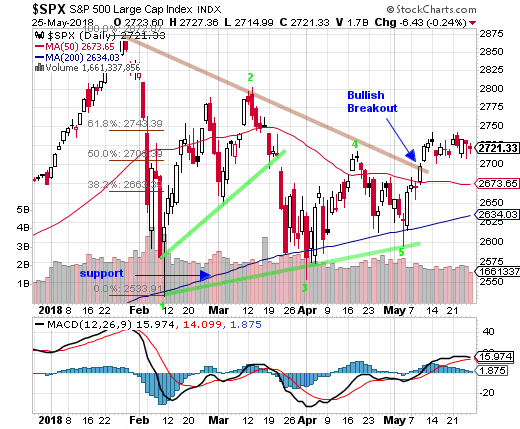 Breakouts or breakdowns from pennant patterns, as seen in the below daily chart of the SPX, typically point to the direction the stock market will now take. Pennant patterns tend to have a five wave pattern. The early May lows were the wave five of a clearly marked five wave Elliott Wave pattern. Wave five to the downside was followed by the breakout. 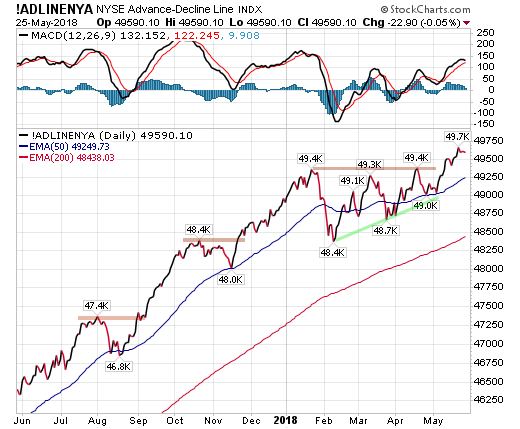 Midweek the NYSE Advance-Decline Line reached a new bull market high. The indicator closed slightly off that high for the week. This indicator tracks breadth and as such is extremely important. New hoghs for the A-D line means it is not just a few powerful companies pulling the market up, but most of the companies are advancing in the broad NYSE which has 1600 stocks. During the week the Nasdaq 100 Index (NDX) posted a bullish trend continuation day on Wednesday. The early morning selloff lows were lower than the previous day's trading range and the rally closed higher than the previous day's highs.